16" 0 - 1 : they win a second corner and this time Ramos rises highest to meet it. His deflected header sits up nicely for Casemiro, who displays some fine acrobatics with an overhead kick from some eight yards out to give Real the lead. 25" 1 - 1 : Some nine minutes later and Atleti are level, but only after VAR takes some two minutes to make sure it is indeed a goal. They were checking for a foul on Vinicius Junior and whether it was offside after Griezmann goes on to stick it through Courtois' legs - and it is indeed a goal! 1-2 : Oblak guesses the right way, but Ramos' penalty - to the goalkeeper's right - is too accurate and he restores Real's lead at the Wanda! 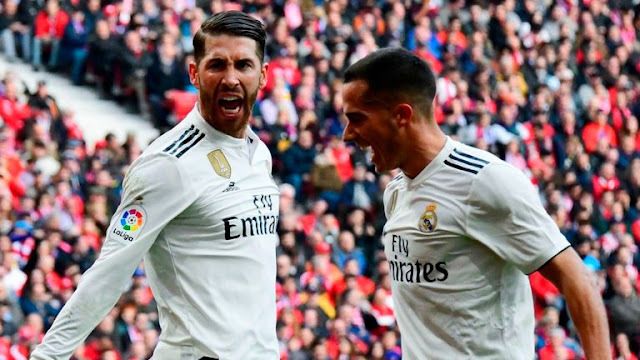 Real Madrid : Courtois 6, Carvajal 7, Varane 7, Ramos 7, Reguilon 7, Casemiro 7, Kroos 8, Modric 8, Vazquez 7, Vinicius 7, Benzema 8. Subs - Ceballos 5, Bale 7, Mariano. Atletico Madrid : Oblak 5, Arias 6, Gimenez 6, Godin 5, Hernandez 5, Partey 6, Saul 6, Correa 5, Lemar 5, Griezmann 7, Morata 6. Subs - Kalinic 5, Vitolo 5, Rodri 5.